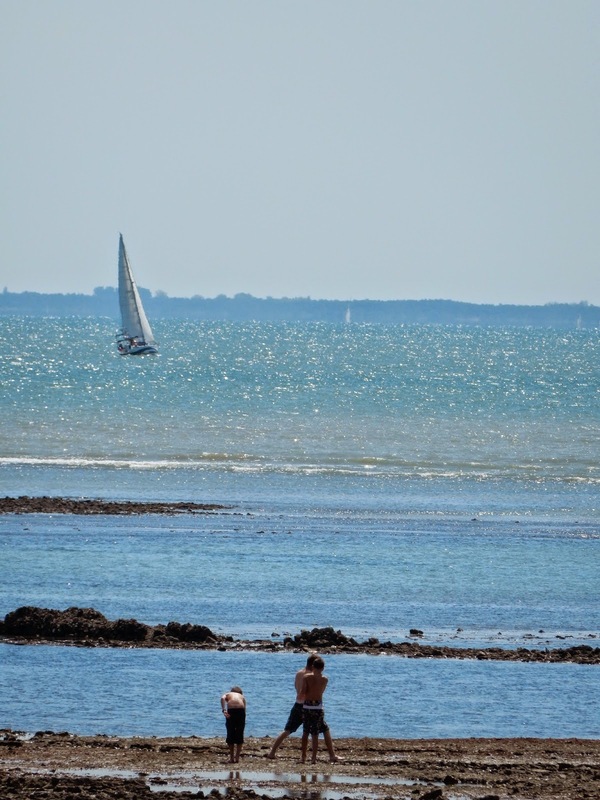 Trivia fact of the day: Île de Ré has a winter population of 20 000. During the summer months, the numbers swell to 220 000. 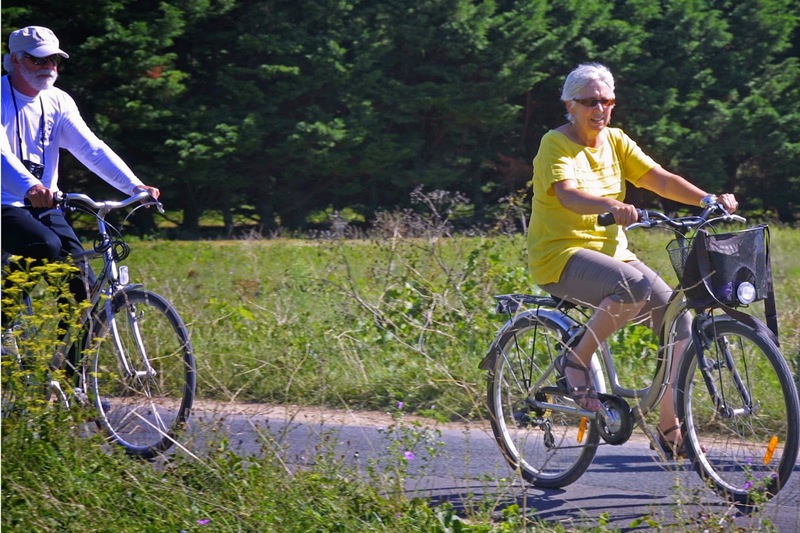 On a glorious Saturday morning, we headed out on the bikes again, this time mainly southeast. 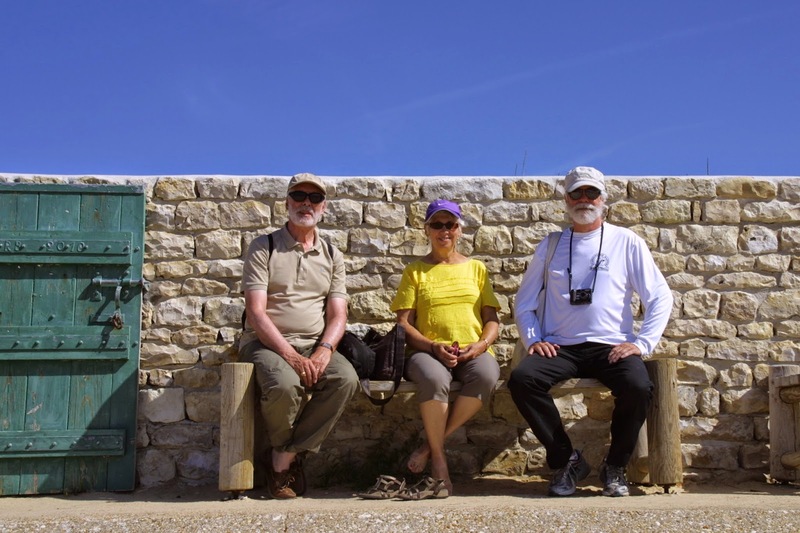 We made many stops along the way for photos, because the island is so very lovely. 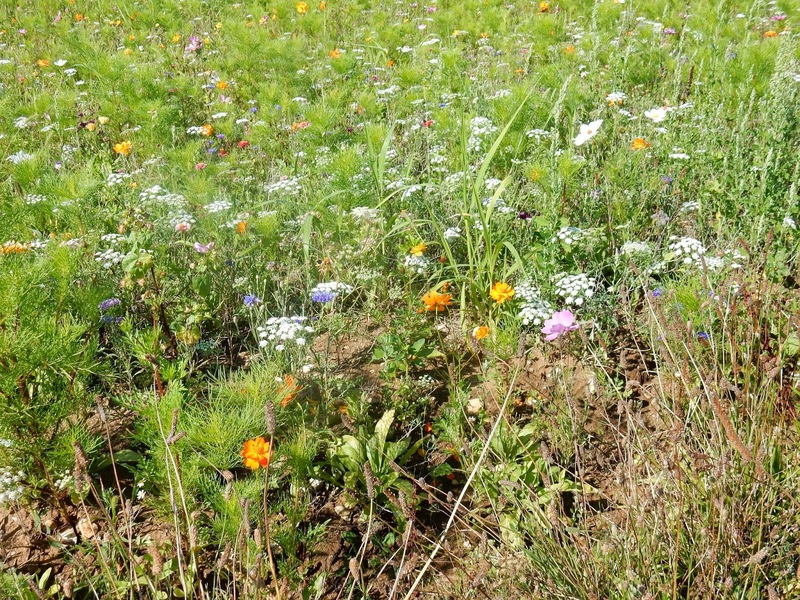 Early on the route, we saw a small field of wildflowers. Even the most common sight seems more beautiful here. Our first stop was at the market at La Noue, a very tiny place. 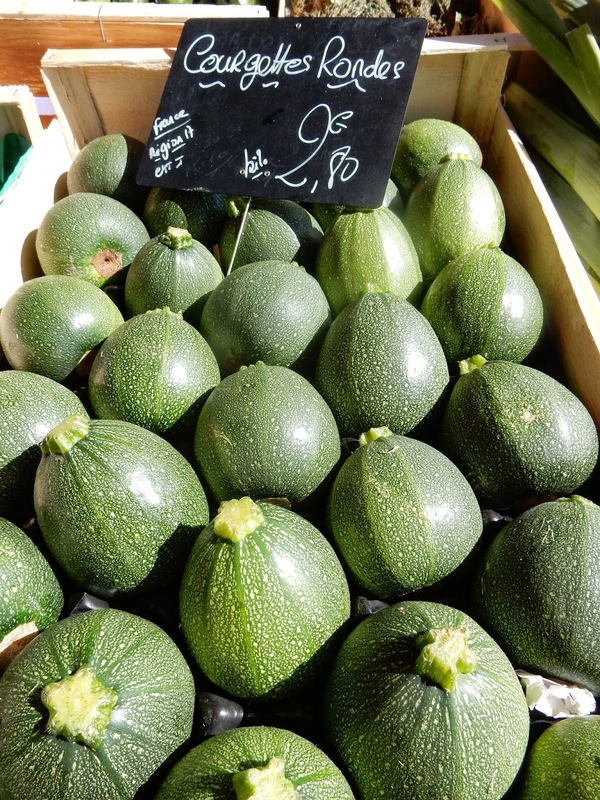 The local produce on sale included round zucchini, and tiny watermelons. With so many tourists here during the summer, there is a market in most towns every day. 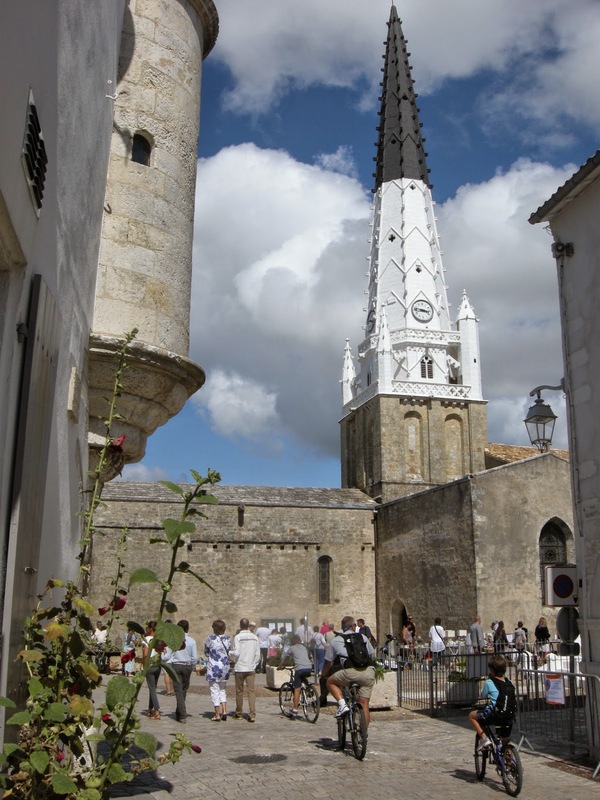 Nearby, we parked our bikes at Sainte Marie de Ré. 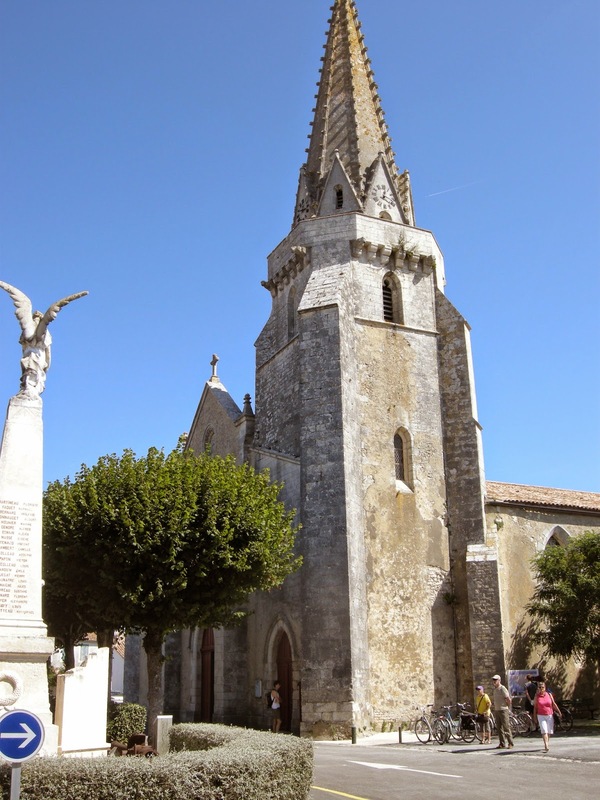 Unusual for French villages, the church is not in the centre of town, but it was well worth a visit. In the graveyard behind it, we saw seven stones in memory of Commonwealth soldiers who died in the area during World War II. These sorts of graves can be found all over France. I intend to look for them in other small towns we visit on our journey. After lunch, (delicious, of course), we headed towards the beach on the southeast corner of the island. 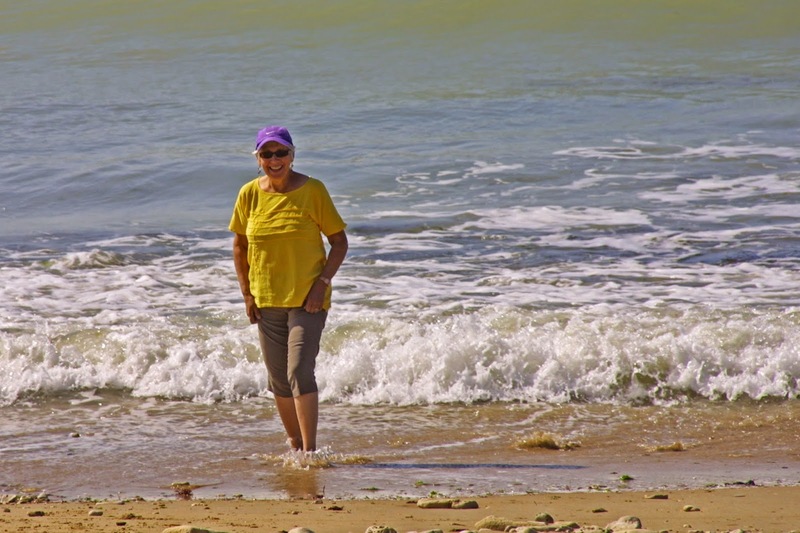 Here the sand is natural, while in La Flotte (on the north shore), the beach is man-made. I was the only one who braved the cold waters to get my feet wet, but we all enjoyed the views of children playing on the shore, sailboats in the distance, and glittering waters. 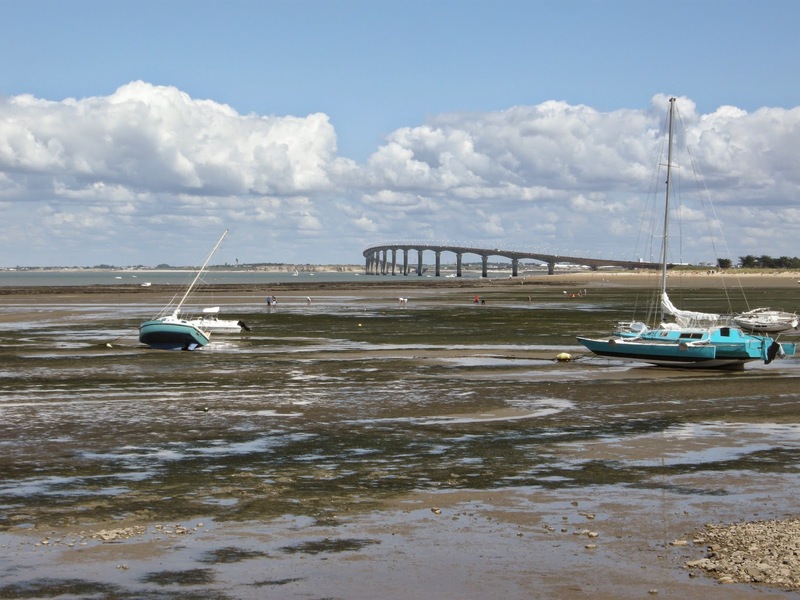 Eventually, we arrived at the easternmost point on Île de Ré, Rivedoux, where the bridge we had crossed to get here spans in the distance. We were at low tide, so the vista included oyster beds and boats temporarily aground. 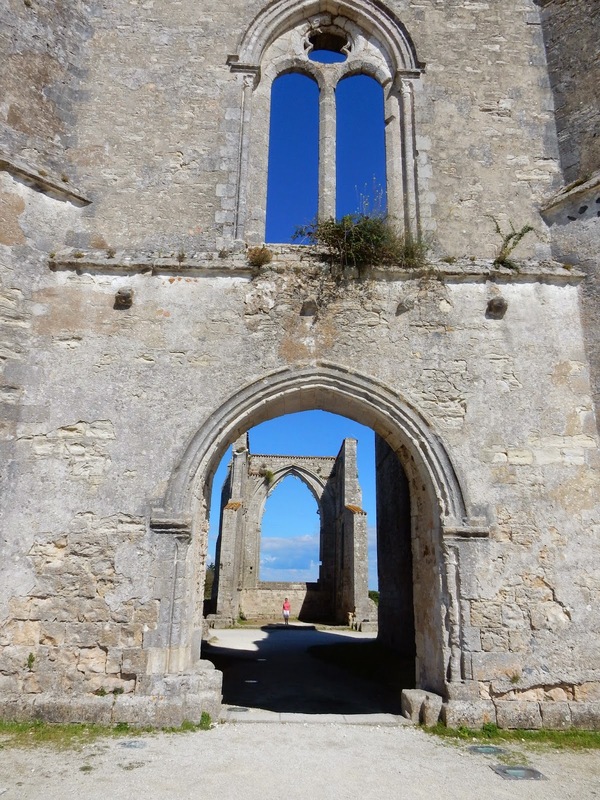 On our way back to La Flotte, we made a stop at the ruined Abbey de Chateliers. It was a beautiful sight against the clear blue sky. 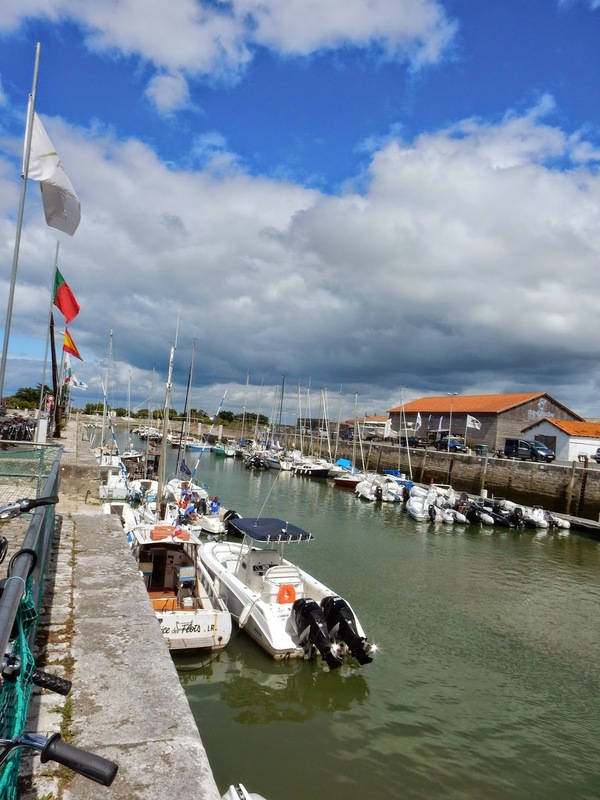 When we arrived back at La Flotte, Tom checked his tracker and announced that we had travelled nearly 50 kilometres on our bikes over the two days. Bob and I certainly felt it in our behinds! In the evening, Janet and Tom treated us to a delectable four-course meal at their favourite restaurant, Chai Nous Comme Chai Vous. Two and half hours later, well wined and dined, we were off to find a spot in the harbour area to watch fireworks in honour of the 70th anniversary the liberation of France by American troops in August, 1944. There were 20 000 people in attendance at this Nuit Americaine and none of us was disappointed. 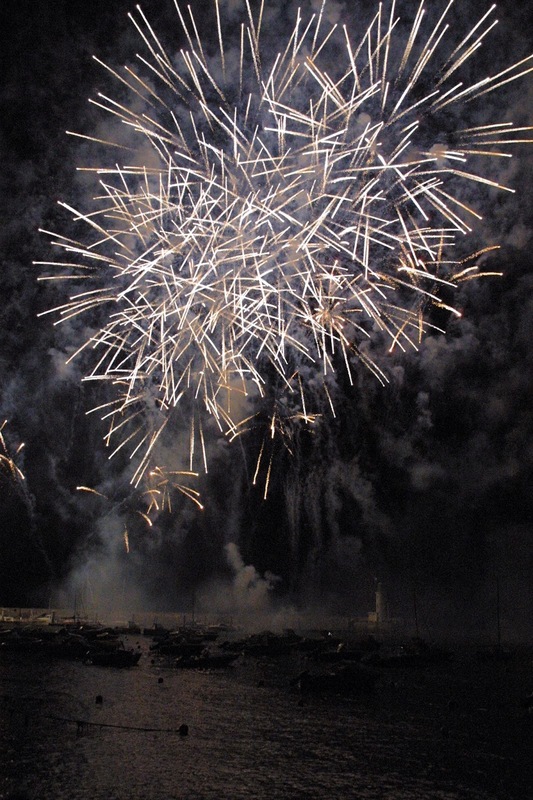 It was a 40 minute show, with musical accompaniment and very impressive pyrotechnics. Fireworks at la Nuit Americaine. You can see the boats in the harbour below. 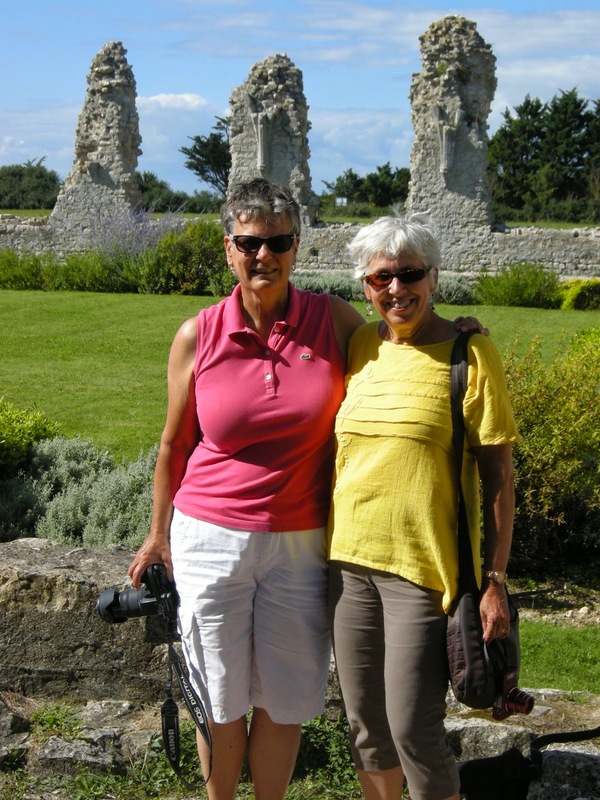 Sunday, we left the bikes in the garage; instead, Janet drove us to the farther regions of Île de Ré. 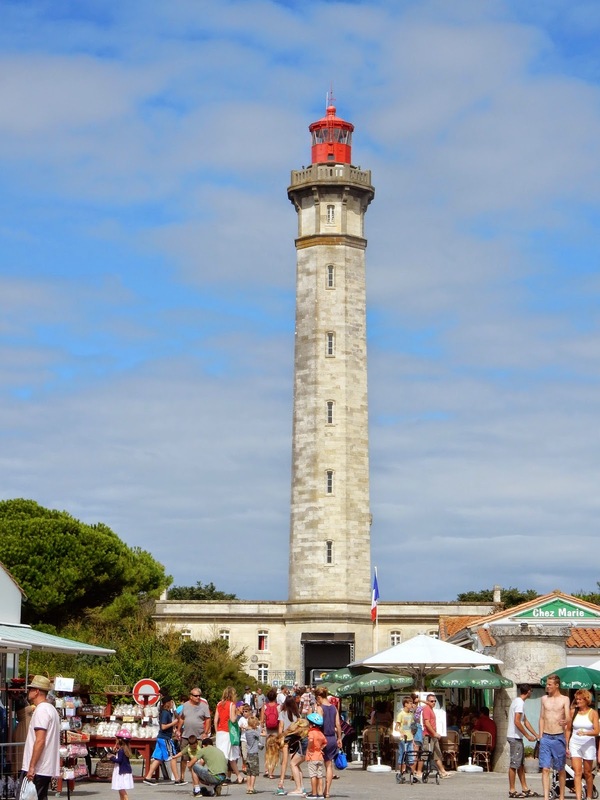 In the northwest end of the island, le Phare des Baleines (the lighthouse of whales) is a beautiful structure, although there are two of them, not one. 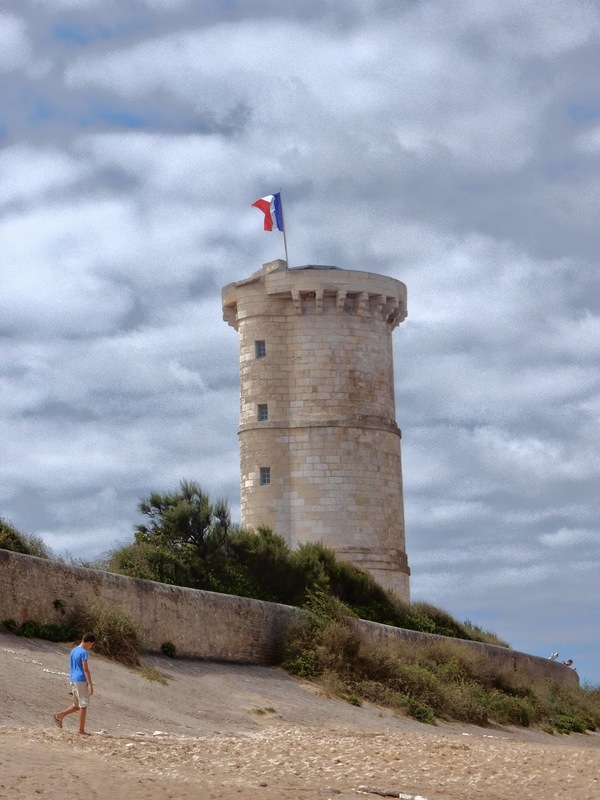 The original tower, called la Tour des Baleines dates from 1682, while the taller structure was built in 1854. We opted not to line up to ascend to the top and instead walked around the area where I again got my feet wet in the ocean. From there, we made our way to Les Portes, where the local market had been set up in the middle of the main street. Apparently, this is the part of the island where many celebrities live in peaceful seclusion. 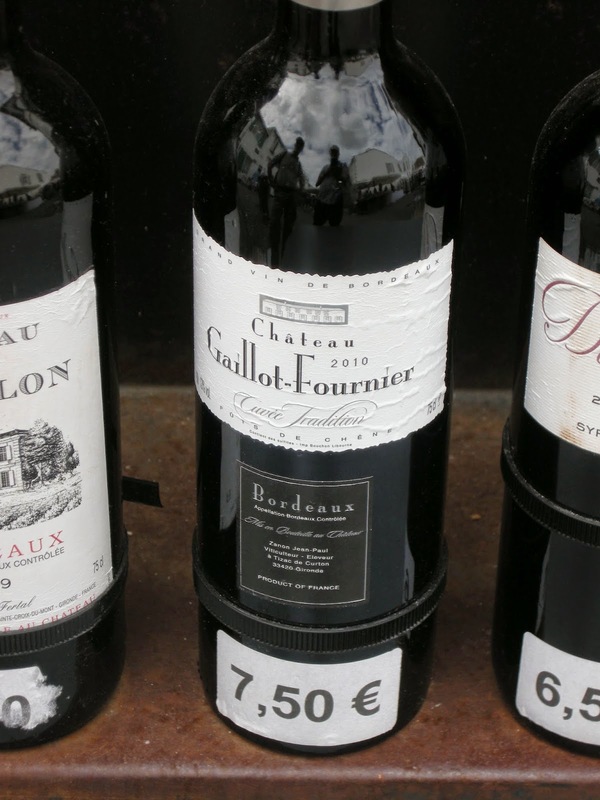 At a shop, I was thrilled to find a wine with my name on it - my maiden name, that is: Fournier. Of course, I bought a bottle. This is our last evening with Tom and Janet. They have treated us very well, and we have enjoyed our time with them immensely. From the moment we arrived, we have comented that this is the best hotel we have stayed at on our trip: the facilities are most comfortable and the meals have been delicious. 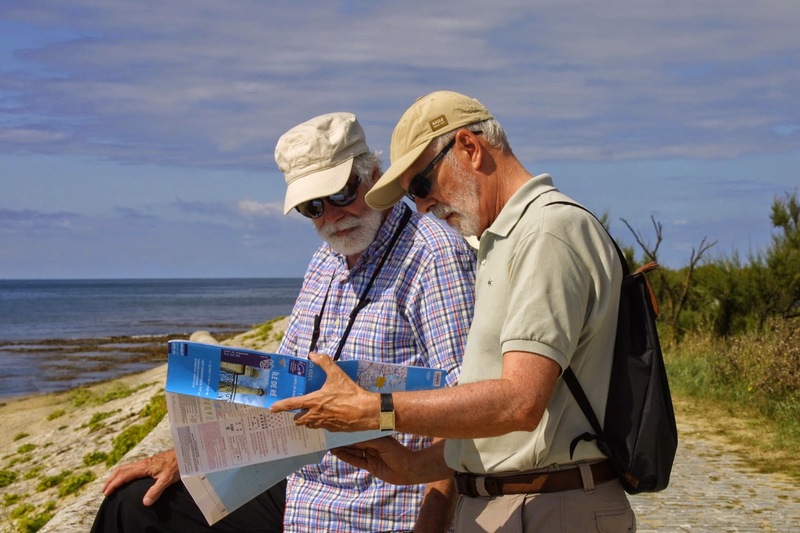 Not only have they been terrific tour guides and ambassadors for the area, but Janet has also provided us with some of the photos you have seen over the past three days and Tom has been a useful historian and a willing proofreader of the blog. We cannot thank them enough, but we hope that we can return their hospitality when they visit us in Neûchatel sometime in the next year. Au revoir, mes amis.